It only took 3 years for me to finish our bedroom design. Perfect timing for our move – hilarious, I know. And, when I say “hilarious” I mean, why didn’t I prioritize this sooner? It is probably due to the fact that I’m so busy designing/styling/shooting everyone else’s homes and having two babies of my own to take care of. But, excuses aside… a popular belief is that designer’s homes are perfect. When in reality the more accurate statement would be that people who have hired a designer have perfect homes. Even as I’m now designing our new home (and trying to do it in a way that starts me off on the right foot from the day we move in) I know that it is going to take YEARS to really finish it and along the process good and bad things are going to happen. It is as exciting as it is daunting. The thing with clients is that you get all the information of functional needs and stylistic wants up front when you first meet with them and then you must set aside time every week, 15 – 20 hours to plan and execute a cohesive design plan for them. You not only do all the work, but you provide support to pull triggers which is 1/2 the battle. Once you have pulled the triggers then comes the install, which can so laborious. Do you know how long it takes to measure, pick out, order, and install the right curtains? Hours… 4 hours if you are buying online and 12 – 20 hours if you are doing something custom. Those hours and that time spent are just for curtains in one room! Back to me: I obviously try to do the same thing for myself and certainly as my job consists of creating content this helps the design process go a bit faster. But, I know that this new house is going to take 3 years to finish it to the point of where I’m proud enough to have it “revealed” much like the last one. 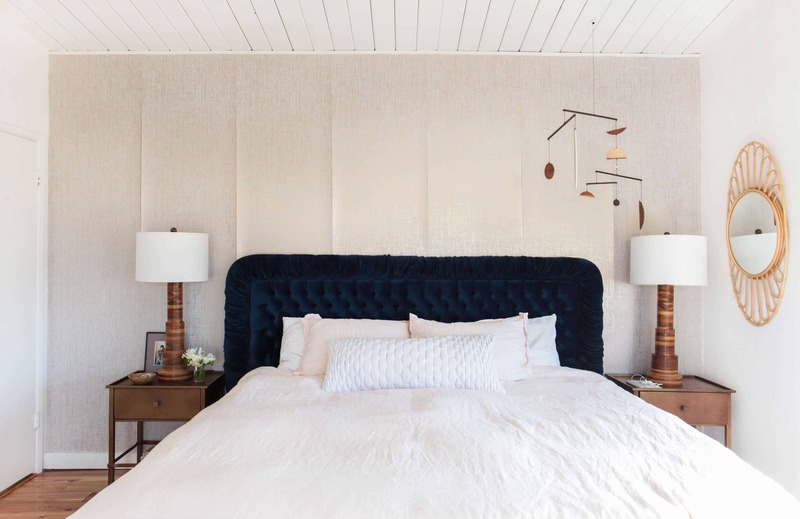 When we moved into the house we brought along our tufted blue headboard, which I still love and we used for a while in this house, but it was time for a new one. We also didn’t have quite the right nightstands, dresser, rug, and a few other pieces, but we lived with it because well, life. It was good, but I wasn’t totally happy with it. I always hated that I chose to install that custom wallpaper we designed on just one wall. Well, I was until I saw that this had happened – read about the whole thing here. In short the wallpaper started peeling up at the seams for unknown reasons and it did not look good. I languished with it like this for a while then committed to properly designing the room. In this process we ditched most of the furniture, and started over with the room like I should have done 3 years ago. Not because you always need to start over to make it right, but because I never really designed it in the first place. I figured before I left I should make this a room that I was proud to photograph and have in my portfolio and not just an “OK” room with good furniture. We started over by designed the custom bed, which I love and you can read the whole process here. Let me warn you, it was quite the process. Once we had the bed in there it was time to get it finished and pull it together for all of you to see. So here you are folks, our master bedroom finally finished with only a couple little tiny regrets. GAH I LOVE IT SO VERY, VERY, VERY MUCH. 1. Do something that is a statement (I have a reputation to protect, after all). So while it would have been easy and totally beautiful to do a simple upholstered and more affordable headboard than the one that is in there, I chose to go balls to the wall headboard and create that custom bed. 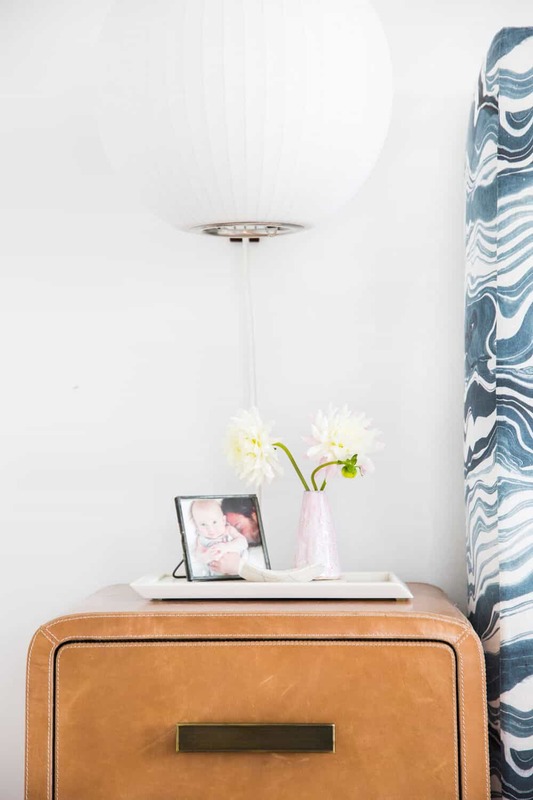 If you want the full story on it click through here, but the short version is that the amazing marble blue fabric is from Rebecca Atwood and we custom designed the piece for the space. 2. However, I didn’t want an insane bedroom. I still wanted everything to be calm, soft, and the type of environment to support cuddling and the hilarious fantasy of a lot of sleep. 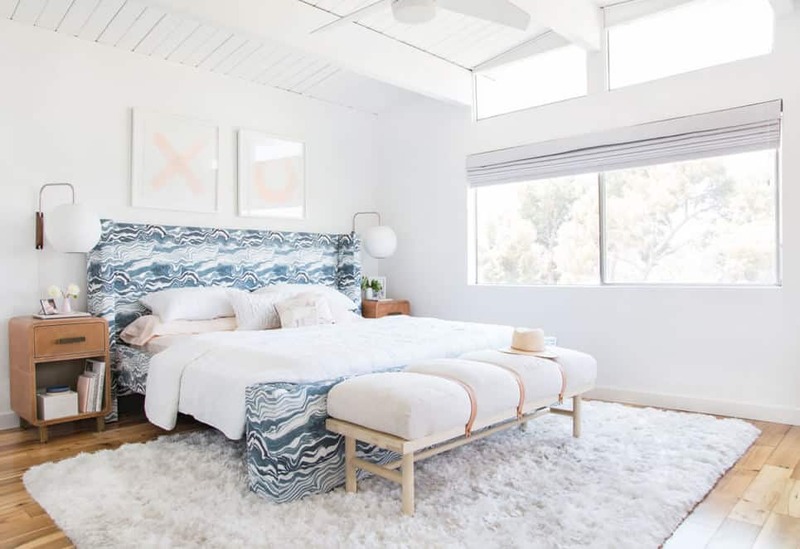 So the rest of the room needed to be quieter – with whites, leathers, woods, and no other dominant pattern or anything too bold due to the pattern and boldness of the bed. The bed is the true star of the room, everything else in there need to be the supporting cast. 3. 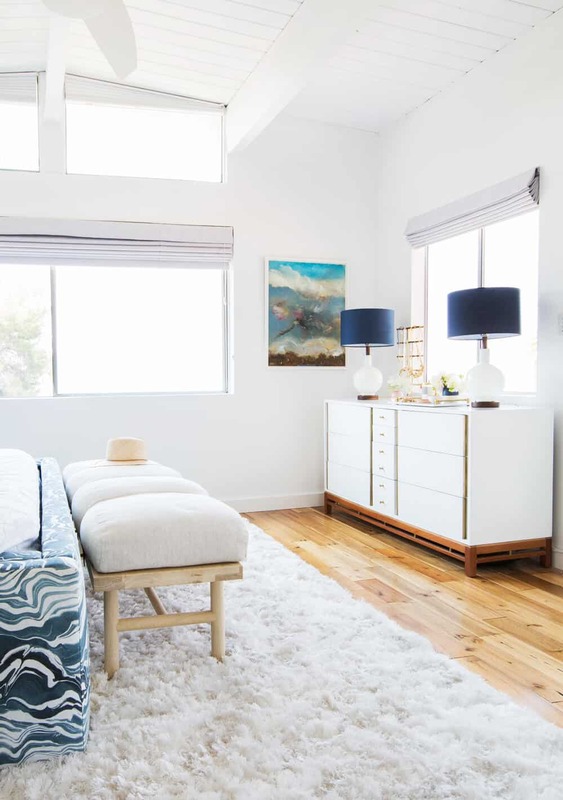 Have it feel cohesive with a house that is Mid-Century inspired in a 2016 (and hopefully) timeless way. 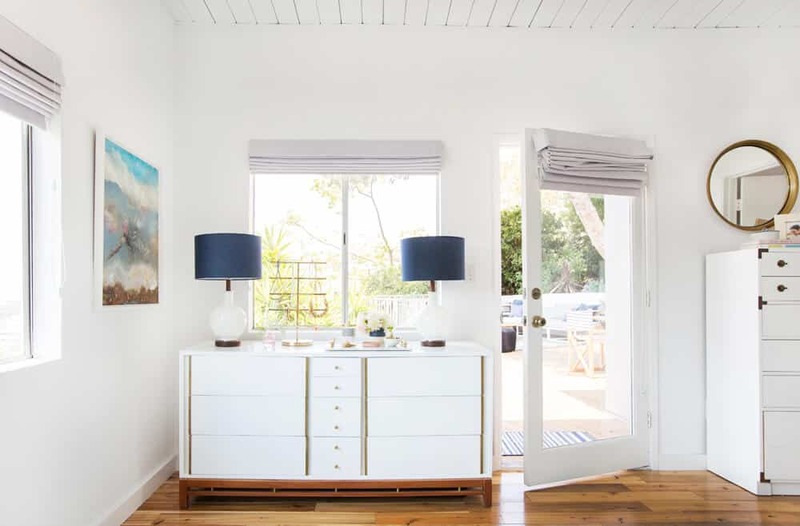 By that I mean the colors in our house don’t have to be the same in every room, but there is a consistent theme of clean, fresh, and soft throughout each space with a heavy dose of happiness. The nightstands – These are my spirit nightstands. They are leather and have storage, but were the right size for the room as once we got that huge bed in there as we didn’t have more than 20” on each side of the bed. They are from Made Goods which is to the trade only, but you can purchase them online here. And yes, the reason they have to be so close to the bed is so the door can fully open. The lights – I originally bought both of these for Elliot’s nursery, but then we only ended up using one, and I realized we rarely even used it. Flash back to when we were pulling this room together and I tried SOOO many lamps. I knew that I needed something with a curvy shape since the bed is so boxy. Then it became quite a challenge to find one that was both big enough for the bed but not too oversized for the nightstand. Anything too tall and skinny felt weird, as did too short and fat. Once I held one of these up above the nightstand and next tot he bed I was like, “UGH … SO PERFECT”. I love the diffused light it gives off, the accessibility of the pull switch on each of them, how it freed up the surface of the nightstand, and the texture of the paper shade is quiet but still interesting. 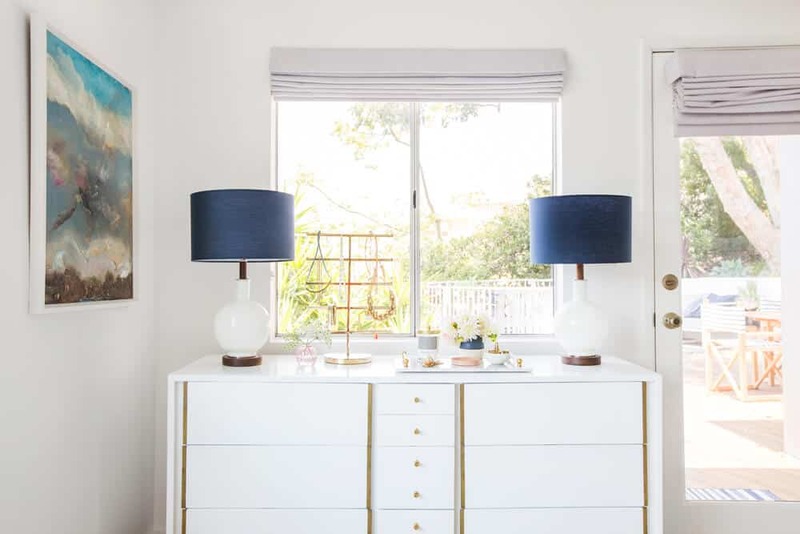 I LOVE these sconces – classic Mid-Century. Wait, I almost forgot about the other lamps on the opposite side of the room. I’ve been a fan of these lamps forever for one solid reason – they have a round shape in a non-boring finish and a non-generic gourd shape. I can’t tell you how hard it is to find a simple lamp, with a rounded shape that does something interesting. The glass and wood combo is pretty and that blue shade… YES. The bench – When I first posted about our new bed I said, “it’s been hard to find the perfect bench” and lo and behold Katy Skelton reached out and said, “lady, I got your bench.” She sent through a photo of the bench and I said, “Dear God you are right.” It’s super simple (anything with tufting would look too busy) and is the just the right scale. It’s not too chunky, but not too dinky to hold it’s weight against that bed. The only downside is that since we are moving and I’m not sure where it would go in the new house, I decided not to splurge on it (it retails for $2, 000). Now, in case you are thinking that 2K is a lot for a bench, it is if it were mass manufactured by a large factory and distributed by a large company, etc. But, she designs and makes these benches and all of her items in New York, and that cushion was so soft, the fabric so high quality and the base so refined. I’m sure there will be some cheaper knock-offs happening starting … tomorrow…for good and bad. But Katy, this simple design is too good and cannot be replicated. My friend Scott wanted to buy it for a project he was working on, so I shot it in the room, thought about it for a week or two, obsessed over it, then ultimately decided that he could buy it for his project. The only reason being that I had promised myself that I wouldn’t buy anything right now that doesn’t have a perfect spot in the new house. And I was also afraid that my cats would claw it to it’s ugly/beautiful death. Anyway, if you are in the market, I highly recommend this beauty. It comes in a few different fabric and leather colors and is stunning in person. 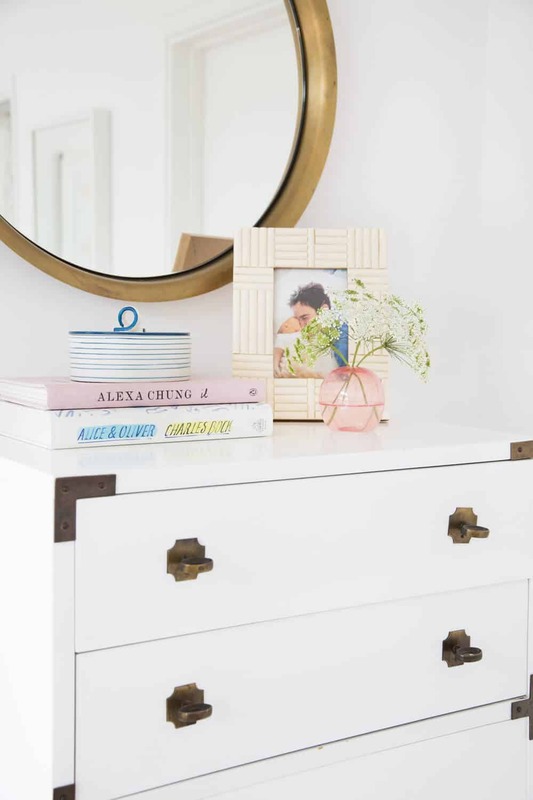 The dressers – both are vintage and have been refinished/lacquered. I love these, although in the new house I kinda wanted to go in a different direction … something more wood and soft. But I do love how these make the room feel bigger and how they work together but aren’t all matchy. The window treatments – We worked with Decorview on the window treatments when we first moved in and they are still awesome. We did a combination of roman shades and then on those triangle transom windows we used this double sided honey comb shade to keep the light out. The bedding – I rotate the bedding often, but typically stick to blush or white with some extra texture here and there. I love these blush sheets from Target that are on it now and then the quilt, which is from Parachute. I normally have a duvet on there which looks great, but the texture of this quilt won out when I went to style it. Also, in case you are wondering those pillows were in Elliot’s room and while I really tried not to steal things from other rooms, they just look so darn good in here. 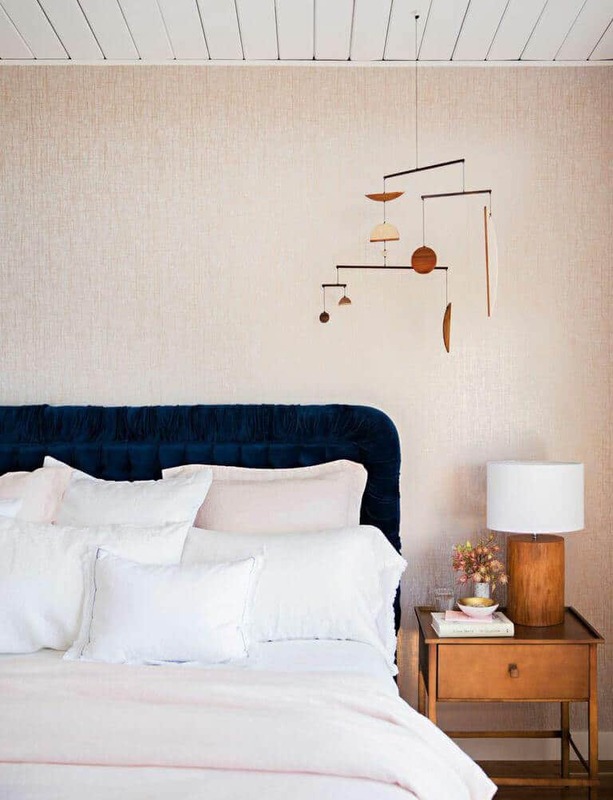 Round pillows are underrated and I think that they are probably about to start flooding the market (we are having some made right now), despite the fact that they cost a lot more to produce. 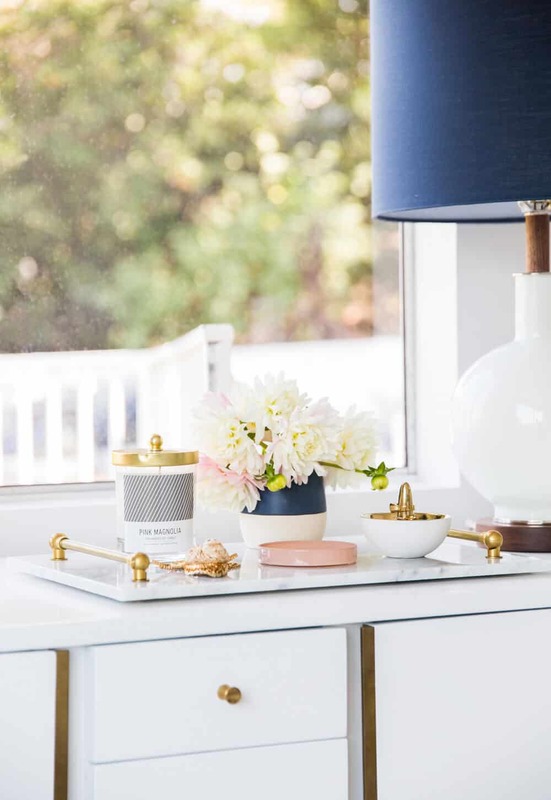 Accessories – I kept it pared back with a couple trays (those nightstands can’t handle my nighttime water addiction without a tray or coasters). The curtains for the closet – We made those from a pretty vintage bedspread I bought in Spain that I had cut and split into two panels (so the fringe goes down the middle as well as the bottom). In my mind it looked a lot cooler than it actually does in person, but I still like it in person enough to keep it there. The closet originally had a pocket door that couldn’t be repaired without a bunch of custom work which sounded like a really boring way to spend money. Especially since most the time it would be hidden in the wall. So I did this instead and I like it. I think if the rest of the room felt a little more bohemian, I would love it, but it does feel a little too boho for the room. I just realized that the tray is from Katy Skelton, too. The jewelry stand and accessories are from target and that tiny pink vase is from ABC home (all linked below). The Rug – Oh the most comfortable, luxurious rug ever (which I stole from Elliot’s room). It’s so thick it’s like a piece of furniture. You might be wondering how a white rug is going to survive near a door to the deck? It’s not. We removed it right after the shoot and put it back in her room. I designed and prepped for this reveal after we knew we were moving. I RACKED my brain on what the perfect rug is for the photo, and then realized that this rug was it – and we already had it. It works because anything too dark would make the room look smaller and could make the bed look even bigger. 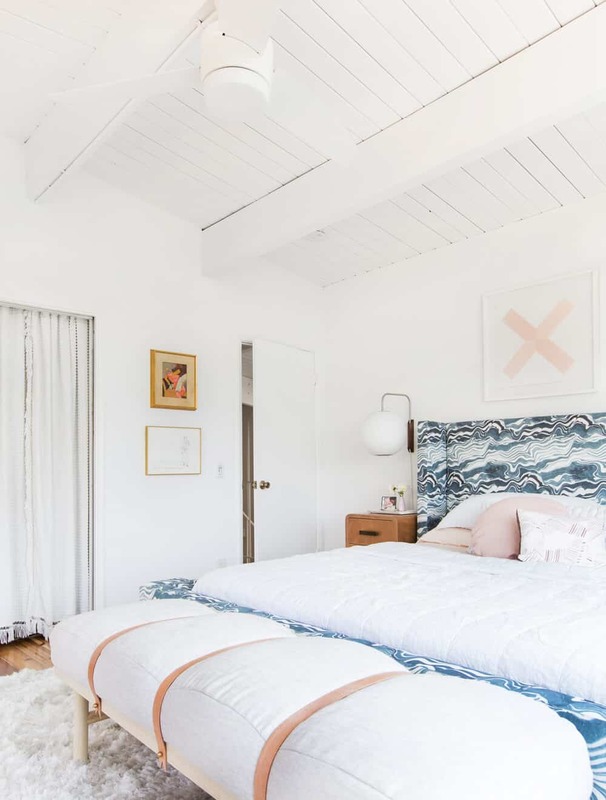 Anything too flat would feel strangely out of proportion with the chunkiness of the bed (I learned that after doing it in the family room – low chunky furniture wants a higher pile rug). And we obviously couldn’t have another pattern. So I said to myself, if I’m designing this for portfolio work, not for my real life (since we are moving) I wanted that rug in there. It’s so pretty in there. For those two days we had it in the room, I smiled every time I went to bed or woke up. As far as durability goes, I’d say you should be a “no shoes” household to have any bright white rug like this. We try hard in Elliot’s room to not have shoes on it, so it’s really maintained its brightness, but I’m sure we’ll need to get it cleaned in a year (at its two year mark) which isn’t really that unusual for a lighter colored rug. Now you might ask yourself what I would put in this room if we weren’t moving? I think it would be a really light sisal with some small organically shaped sheepskin rugs on both sides of the bed. I think that would be durable and work design wise just as nicely as the big white shag rug. 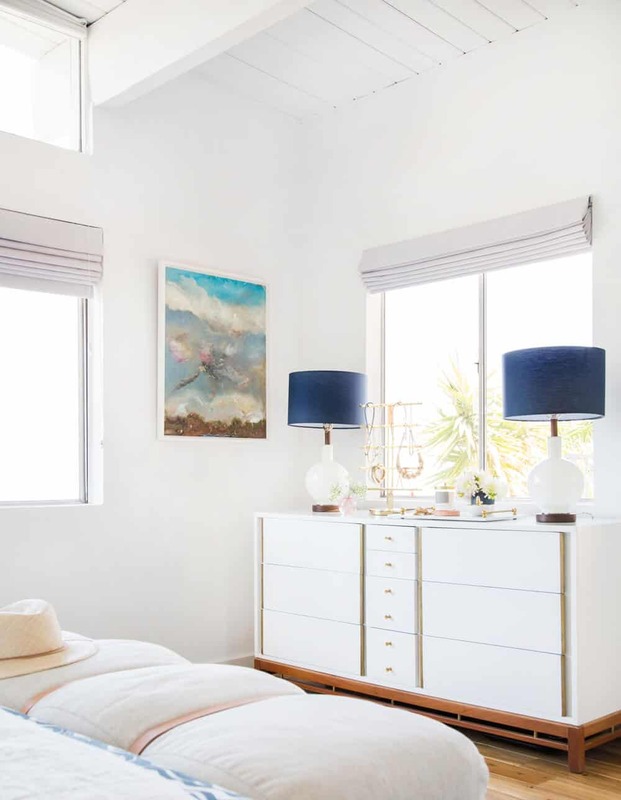 The artwork – The artwork above the bed was originally for our master bedroom, then when we were shooting Elliot’s room I put them in there last minute and loved them and vowed to keep them in there. But, nothing worked above this big bed, like those two pieces did. 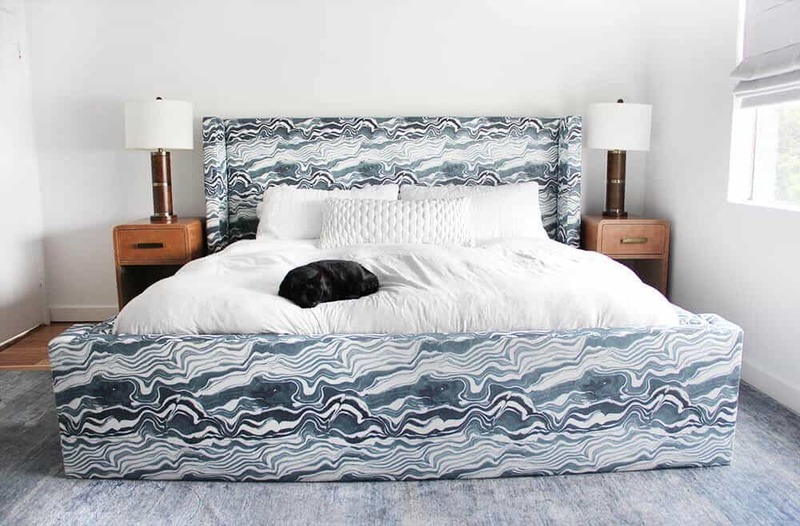 We needed something quiet to compete with the headboard, with a graphic pattern to offset the organic movement of the bed. We needed a horizontal piece that was to scale. Finding one piece that did all of that would have been difficult, but two square pieces that had texture and were graphic ended up being perfect. 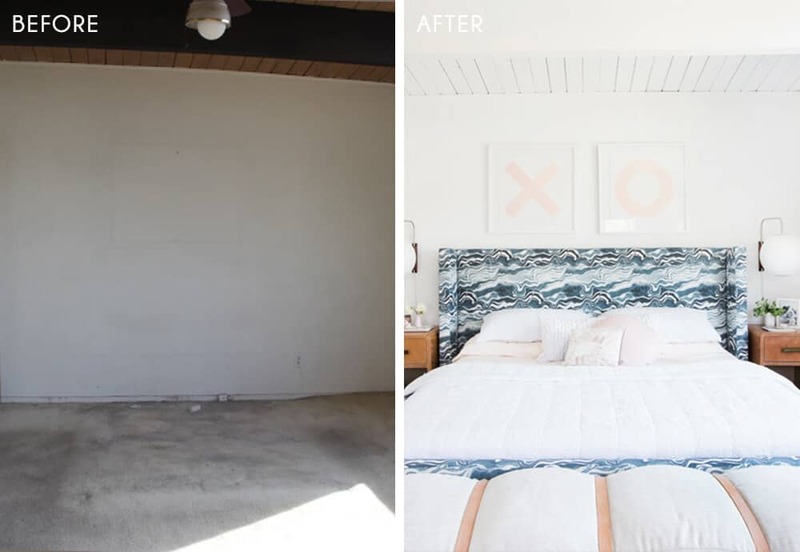 And, just because you know we love a good before and after – here you go. I love it. If I could go back in time I would have designed the bed to be smaller, width-wise. The scale of it made the whole thing harder to manage, but thank God it came together. I’m going to be so sad to leave this room. Our new bedroom is smaller and not flooded with so much happy light. There is no perfect house and our new house has so much to offer, but the “master” can’t hold a candle to this one space and light -wise. We have three more months of enjoying this room before we move. See more posts from my house: Giving New Life to Our Old Wood Deck, Our New Master Bed Design, Guest Bathroom Sneak Peak, Guest Suite/ Home Office Progress. I absolutely love the bed and the fabric! It is quite a statement but at the same time with all the white around it, it’s so quiet, it reminds me of the ocean. Then the bench, absolutely adorable. It took a lot of effort and time but your room is indeed an inspiration! My life just came full circle! Growing up, my aunt had a very lovely mid-centuray home. 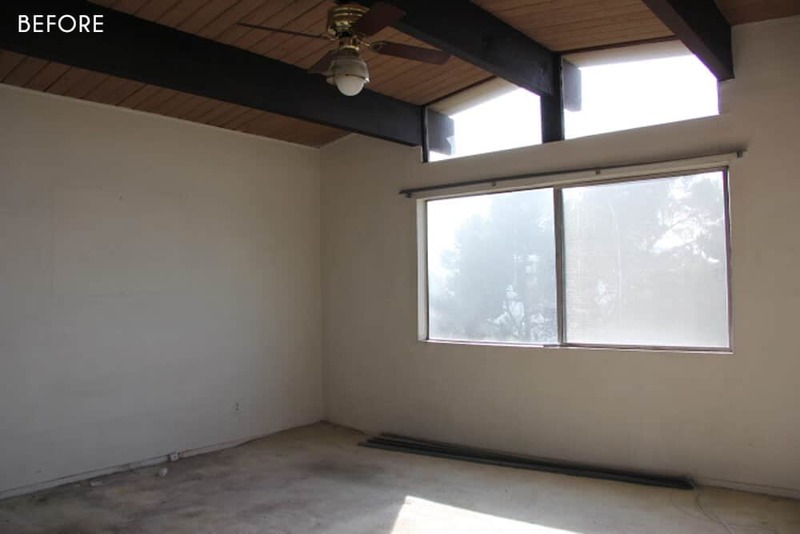 Vaulted ceilings, low chunky furniture and SHAG carpet! (It was pretty). I can always remember the “feel” of the room (and long for it), and looking at your bedroom it recreated that feel. It’s the high pile rug and low chunky furniture! I never ever woulda put my finger on that! But now that you say it, I get it!! This bedroom is literally where dreams are made, enjoy every last second your there before the move! Gorgeous as usual. I agree, those nightstands are my spirit nightstands as well! It looks so fantastic! Thank you for styling our bench (and tray!) 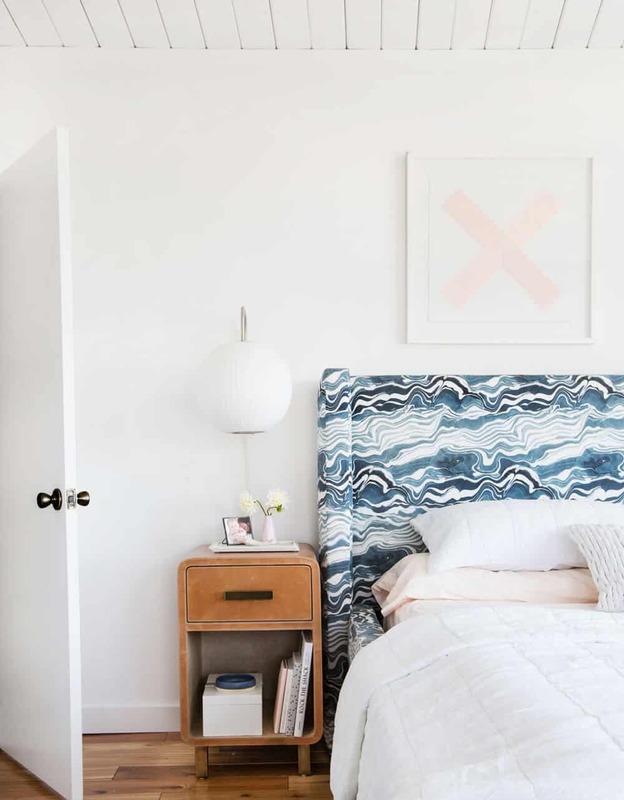 in the room and we are so happy to see it next to the gorgeous Rebecca Atwood fabric on your bed. Can’t wait to see what you do in the next house! Loved those pieces so much, they are so good they basically styled themselves! Hi Katy – where do you find the color combination for the bench that Emily used in her room? I see only one option on your website! Beautiful bench! Thanks! This cushion was a custom fabric that we did but I can still get that fabric for you (it’s by Robert Allen). We have 4 options for the leather straps, and can do a variety of woods, too! Can you email us at info@katyskelton.com and I can get you more details? Thanks! Absolutely gorgeous Emily; I love the room reveals the best. I haven’t commented about it yet but I am ridiculously excited about seeing everything you do in your new home. I’ve loved watching the way you’ve transformed this house over the years and can’t wait to see what you do in the new place. Yay! That bench is to die for. The editor in me wants to tell you…It’s ‘pared back’. Like paring an apple. Paired is for your pair of lamps. love you..forgive me! So pretty and fresh! 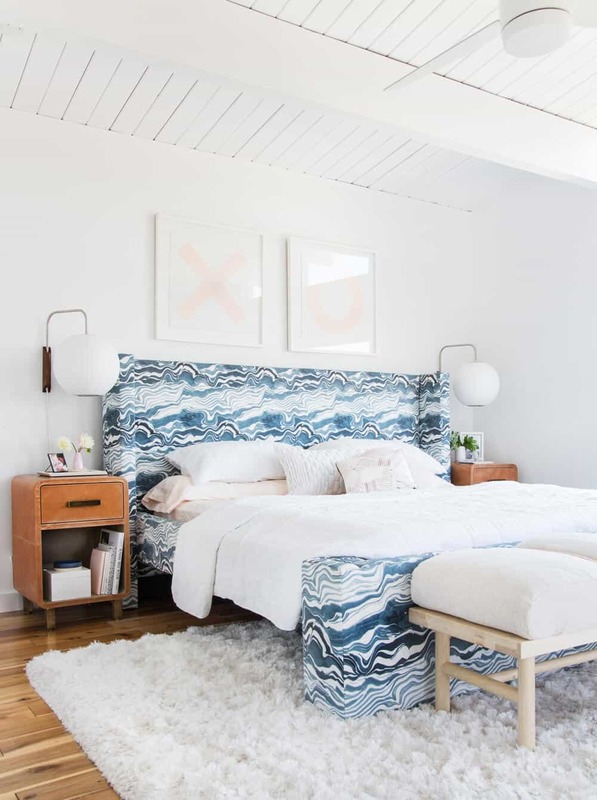 Love those nightstands (and the bed! )… you always know the perfect places to splurge. Now that you are moving and you purchased a lot of furniture for your current home, do you plan on bringing that furniture with you? Selling it on the Flea? You having to sell your brand new custom bed is so sad… But I am so excited for all the new projects at your new house! Where did you get the beautiful painting?! It is vintage and I picked it up from the flea market years ago. It’s too good to get rid of and so happy it worked so well with the room. 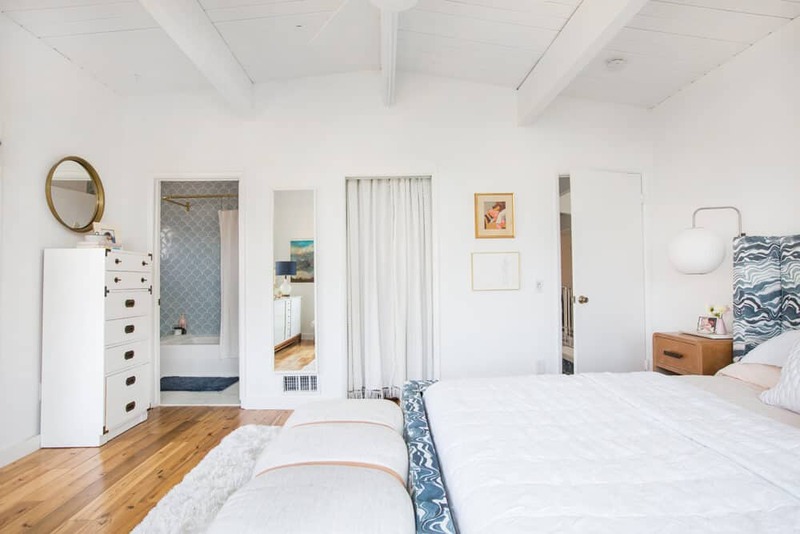 So I super love this bedroom for this house…but I really hope you go a different direction in your new one and sell this bed/lights etc with this house. It just fits this style so well! And if would so fun to see you do a different style. 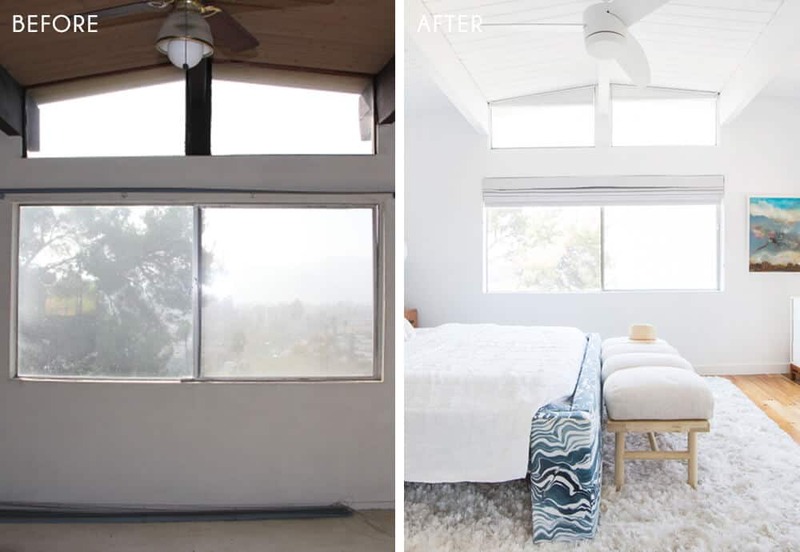 I’ve always had one question though… Why have you always put the bed on that wall so you have to walk into the side of it verses under the window where you would see the end right when you walked in? Just curious if there was other stuff we can’t see that prevents this. WOW! 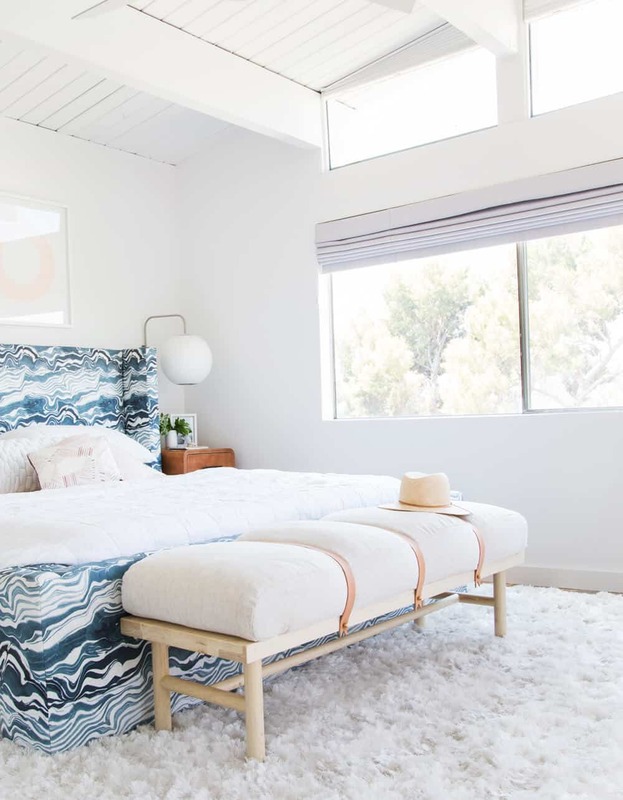 While the bedroom is gorgeous, and that bed is so unique and cool and definitely quite a statement, I have to say I think the BENCH may have stole the show on this one! I’ve been curious as to whether you will use your new bed in the new house? I’m SO excited to see your take on a tudor and more traditional design, but I’m having a hard time imagining that fabric feeling at home in a house like that?? 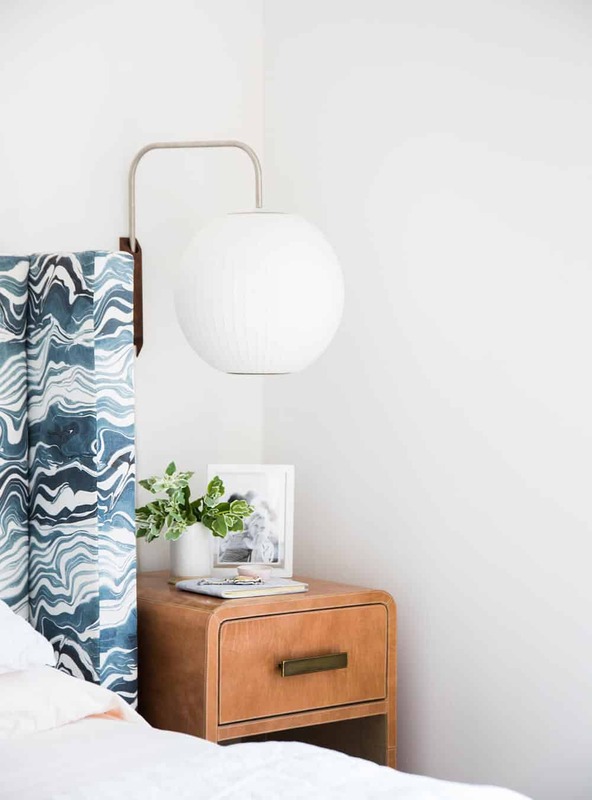 Obviously you can make it work and I’m sure it will look beautiful if you use it, but I wanted to hear your thoughts on it, as the styles seem so different…. Now that’s a bedroom! Emily, I love how pulled back everything is, while still looking so luxe and livable. At least you have a couple months’ sleep in the space before your move. PS-Is Elliot the happiest most joyful little bird baby there ever was? That photo is so precious! Lovely, lovely room! Everything is absolutely perfect. 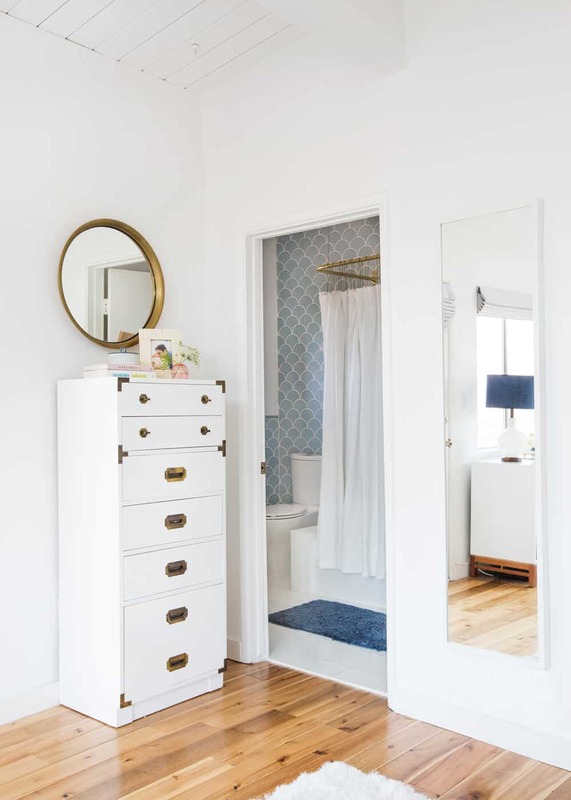 Emily, can you mention where you purchased the vertical white mirror? 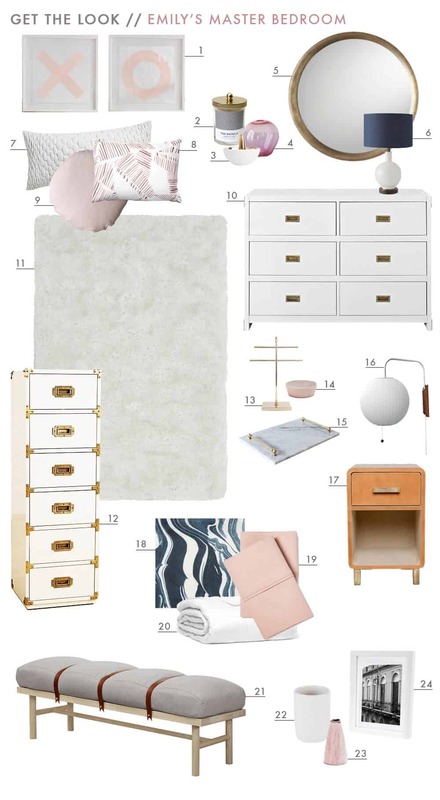 Obviously not the most critical source to share, but it’s exactly what I’ve been looking for size and style wise for my guest room. Love the vibe of the room – bright yet relaxing. Congrats! Yes! Please share. I am looking for that exact mirror as well. Thanks! Hi Emily. Love the room. Was wondering your thoughts on your ceiling fan? Must have in a bedroom. We’re gut renovating our home and I’m on the fence about putting in fans. I love the one in your bedroom. Where’s it from? Thanks. Heaven! Everything looks so beautiful, inviting and tranquil. I can’t wait to see how that bed lives in the new house. While it is not my taste, I get why it works for you…. So Bravo! 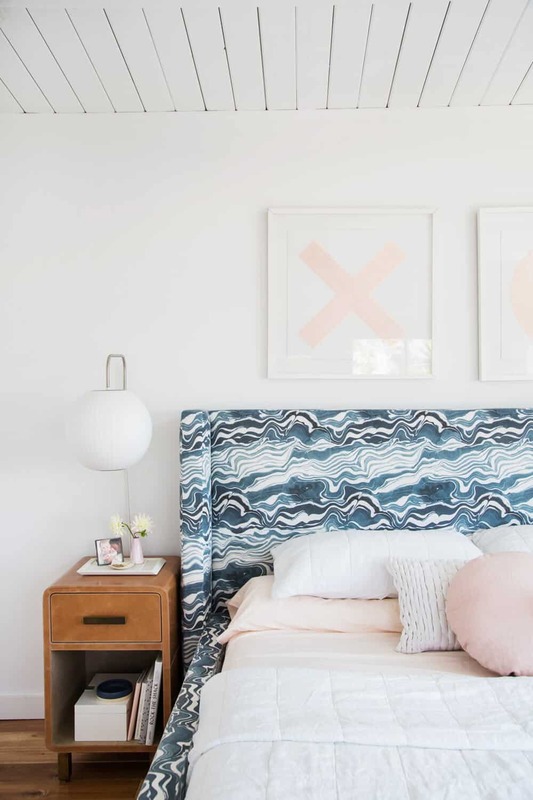 The bed is amazing, and the pale pinks with dark blue is such an unexpectedly perfect combination here. Love!! Beautiful!! Thank you for sharing the sources. I think that bench is just what I have been looking for!! Quick question – have you written about how you keep your cats from ruining your furniture? If they would tear up the bench, I’m guessing they would also go for the bed. Any suggestions you have would be greatly appreciated. Love my cats, but hate how they ruin furniture!! Of course, you just get it perfect and you’re going to move. At least you can enjoy it for the next six months. Love where you ended up after several steps. Actually I flat out love that first padded midnight blue headboard. I’d beg you for it but I thinki it’s king-size and I need a queen. So even your in-between steps are stunning. That bed is magic. This room is such an inspiration for me. Thank you for sharing your love of design!! Love it, even though mid century is not usually my style. I can’t wait to see your more traditional house. I really need to concentrate on fixing up my master bedroom. Why do we parents keep the worst for ourselves? This year I’m decorating my home office since I just started to home from home full-time. I must force myself to do the master next! Love it all! I’m probably brain dead but did you say what color of white paint you used? Thanks! I like it! I always say we are learning by mistakes! I have to do some changes on my bedroom too. You inspired me! Where did you purchase the finials for the lampshades in the progress picture? 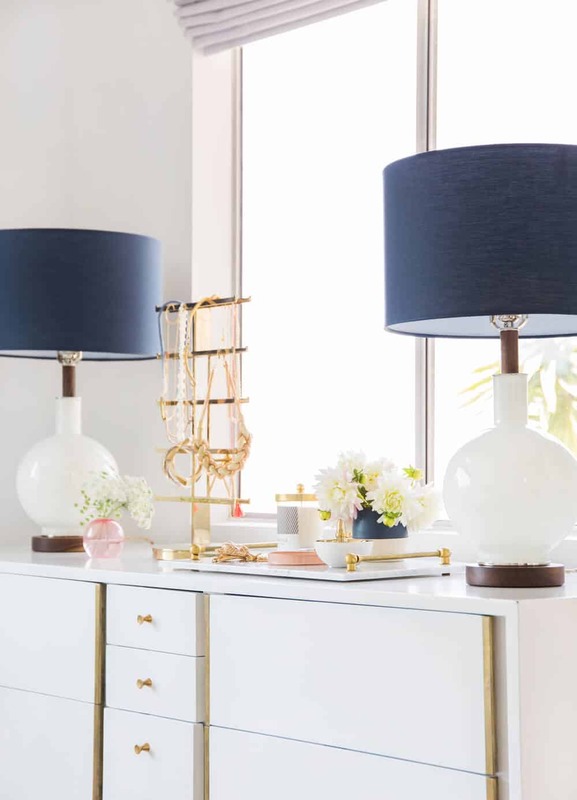 I see that you customized the Target Threshold walnut/brass lamp bases with the finials/shade, and I am obsessed! Love your work Emily, and I recently purchased your book. I’ve nearly read it all cover to cover! The room looks great and I have already pulled some ideas – thank you for listing resources. I know you already said where you purchased the dress, I remember a ball park price, but would you mind telling us again where it’s from. I’ll miss that room when you move! We’re shopping for a bed right now. I remember at one point you had a fancy mattress, each side of which could be raised and lowered… Are you still using it? Do you like it? Would you recommend it? Thank you for jogging my memory on this! I, too, love your George Nelson sconces but do they give off enough light with which to read? Maybe it’s my 52 year old eyes, but I can’t imagine that I would be able to read by them. And can you please talk about where to hang sconces at the bedside? I just purchased sconces from Cedar and Moss and have agonized over exactly where to hang them. Thanks! What color a white paint did you choose for your bedroom Emily! Looks beautiful! Love the bed fabric! I love and truly enjoy your blog, and all your work, and picked you out on Design Star on the very first episode. Thanks so much! Wow, this is my dream bedroom! Lovely bedroom! The colours, the atmosphere… Can’t wait to make something similar at home. Cheers.